Fans in some of Western Pennsylvania’s most impoverished neighborhoods pack local stadiums in fall to watch their storied football programs perform through declining enrollment, diminished tax bases and drops in school funding. Like now-defunct rivals at Duquesne and Cornell, high school teams for Clairton, Jeannette, Rochester, Aliquippa and Sto-Rox boast some of the most historically successful teams in Pennsylvania history. They know their futures are not guaranteed. With tax hikes and refinancing, Jeannette students should be able to hold off a long-awaited merger with nearby Greensburg Salem, Hempfield Area or Penn-Trafford. Advocates herald charter schools while established public schools like Sto-Rox see their own enrollment — and athletic talent — plummet. Aliquippa and Clairton each appeared in WPIAL championship games, but both remain on financial watch lists as their overall academic achievement rankings fell well below state expectations. While other extra-curricular activities fade away with the declining tax base and the waning economies of these once booming industrial towns, Friday nights still bring people out to the sagging bleachers of area high school stadiums to rally around these storied football powerhouses. 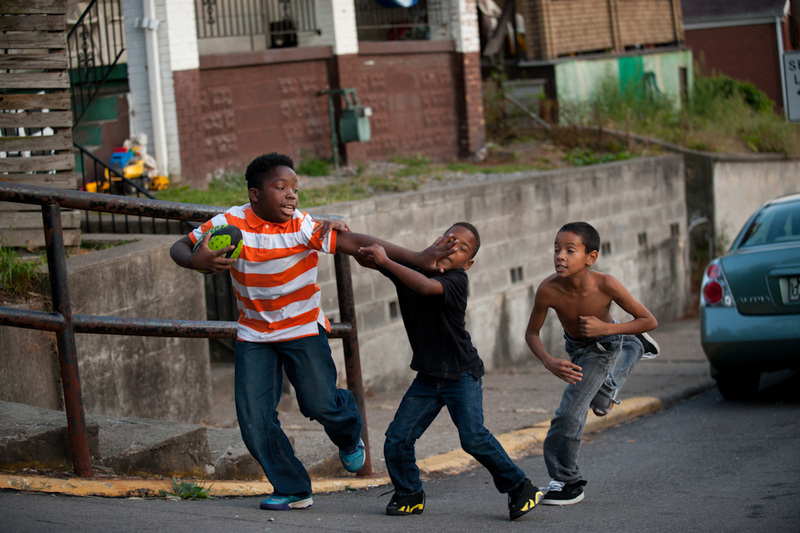 Jerry Robinson (left), 10, blocks Brandon Turner (center), 4, while Shalen Burton, 8, chases after as they play football in the streets of their neighborhood of McKees Rocks on Wednesday, Sept. 17, 2014. The boys say they all aspire to grow up and play football for their high school. "Football is the last hope they have to learn the ideals they need in life," says Sto-Rox assistant coach Tony Ruscitto, 73, who coaches the high school football team with his son Jason. "This town, what else do they have besides football?" 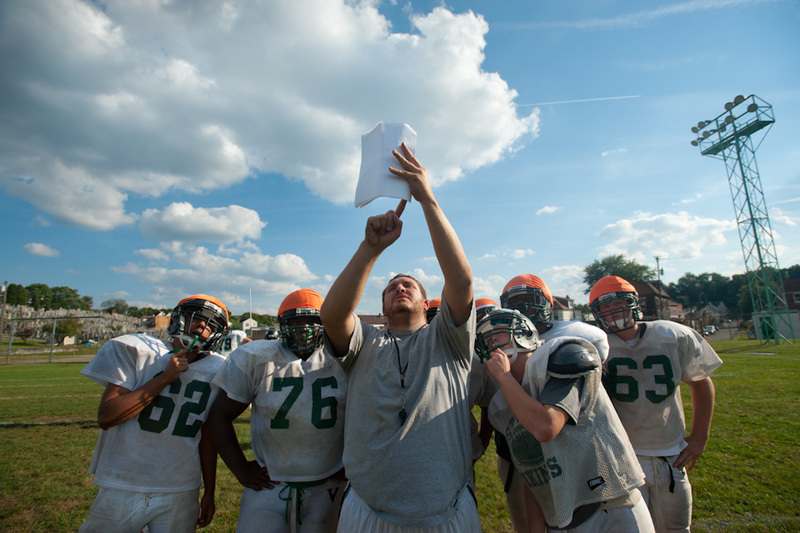 Line coach Nick Arlotta goes over plays with Sto-Rox high school football players during practice in McKees Rocks on Wednesday, Sept. 17, 2014. Arlotta is one of several Sto-Rox Vikings coaches who have returned to coach at the high school where they cut their teeth years before. 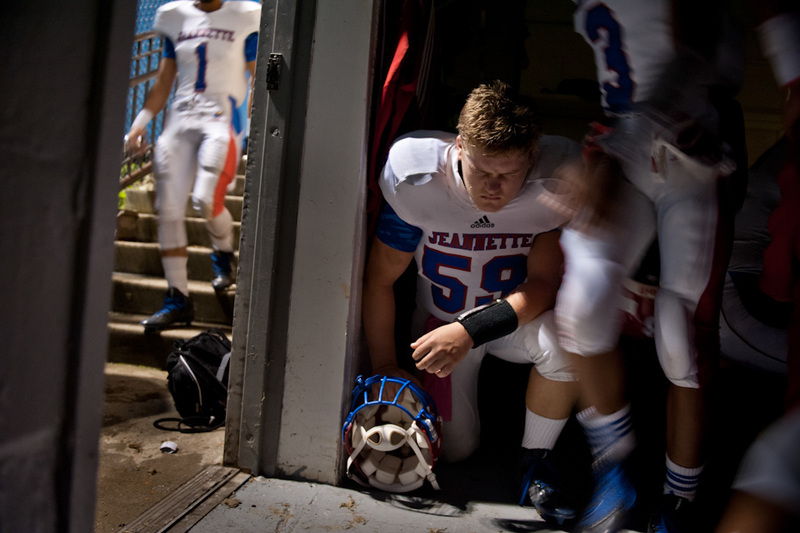 Jeannette Jayhawks OL Joseph Soles takes a moment in the locker room at Neil C. Brown Stadium in Clairton on Friday, Oct. 3, 2014. Before the night's game, the storied Clairton and Jeannette football teams last met in a football game 99 years ago. 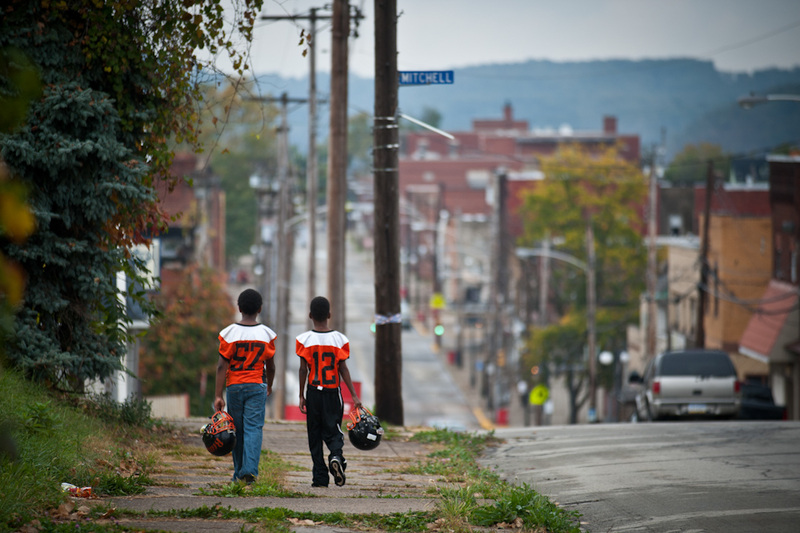 Allen Rice (left), 11, and fellow Clairton Mighty Mites player Zaquan Geeter, 12, walk down the street in their city of Clairton on Friday, Oct. 3, 2014. Both young footballers have played since the age of four or five-years-old, they said, and dream of playing on the city's legendary high school team, the Clairton Bears. 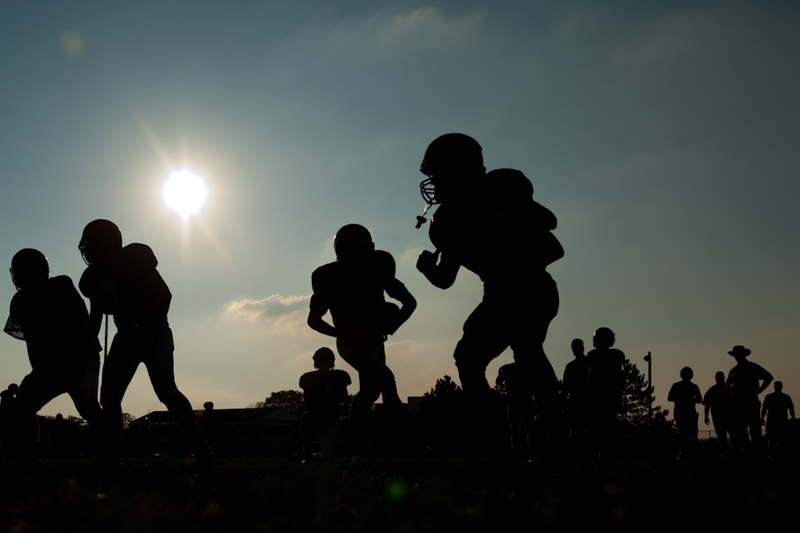 The Jeannette Jayhawks football team run plays during practice as dusk settles over McKee Stadium in Jeannette on Wednesday, Oct. 1, 2014. With legendary Jeannette quarterback Terrelle Pryor practicing his own cuts, catches, and passes along the sidelines, the players worked to add to the team's history as the pride of the once bustling manufacturing city. 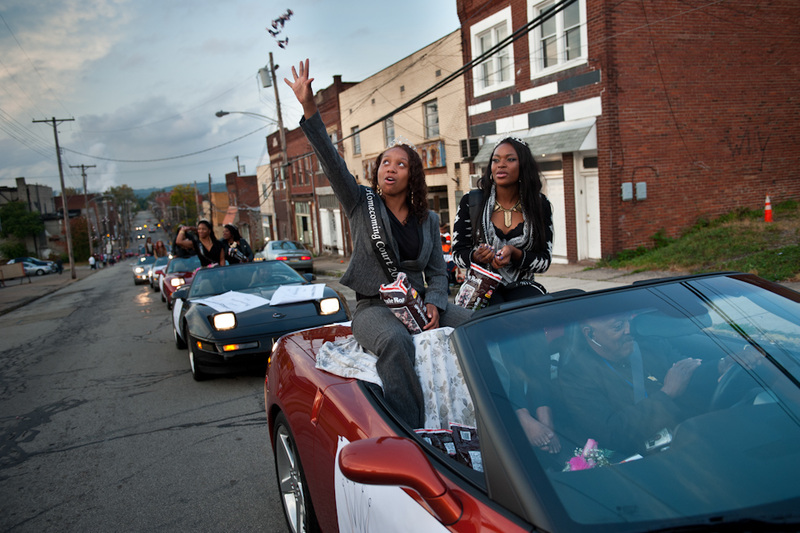 Clairton Middle / High School homecoming court members Serenity Simmons (left), 17, and Kamiah McClellan, 17, ride in a pre-game procession towards Neil C. Brown Stadium in their city of Clairton on Friday, Oct. 3, 2014. 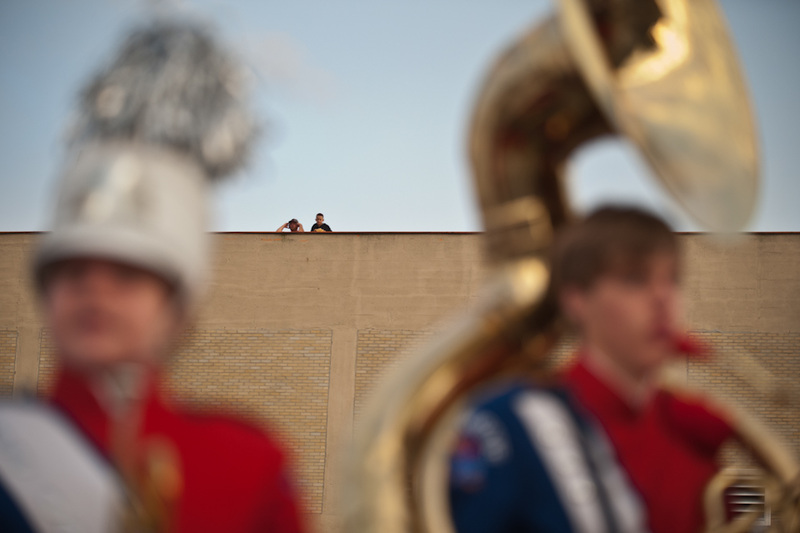 The Jeannette Jayhawks' marching band clap as they watch the Clairton Middle / High School marching band and Honey Bears dance team parade by in a pre-game procession towards Neil C. Brown Stadium before the rival teams' Friday night match-up in Clairton on Oct. 3, 2014. 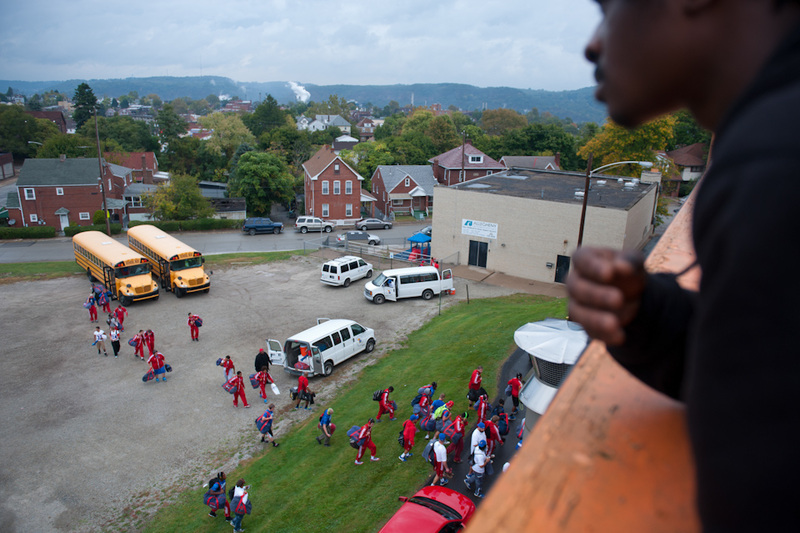 Smoke from the USS Clairton Works rises on the horizon as Clairton Bears running back/linebacker Ziare Rosser looks out over the Jeannette Jayhawks unloading from their buses at Neil C. Brown Stadium in Clairton on Friday, Oct. 3, 2014. Before the night's game, the storied Clairton and Jeannette football teams last met in a football game 99 years ago. 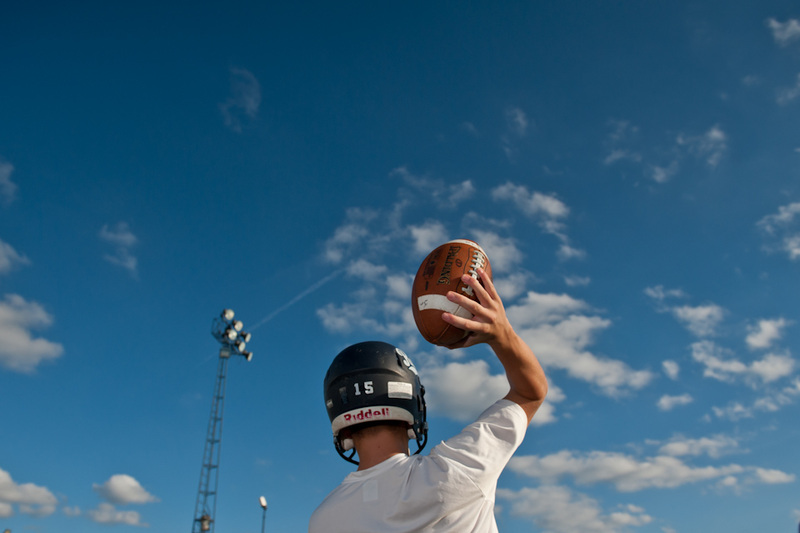 Rochester Rams players practice against a bright blue sky on Thursday, Sept. 25, 2014. "It's a blue collar town, hard working people," says tight end coach Jim Siget. "Pretty much all the staff are all alumni from here. We all played here." Clairton Bears fans and former players watch from outside the stadium fence at Neil C. Brown Stadium in Clairton on Friday, Oct. 3, 2014. Clairton's football tradition runs generations deep, with sons, brothers, uncles, fathers, and grandfathers that were once out on the field in black and orange now watching intently from the stands and sidelines. 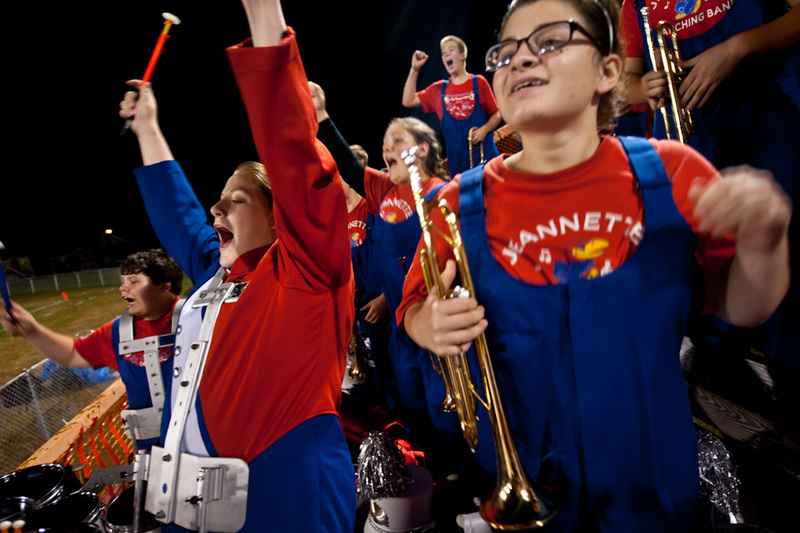 Drum captain Samantha Welshons (left front), 15, and trumpeter Tara May (front right), 17, both of Jeannette, cheer alongside their fellow Jeannette Jayhawks marching band members as their school football team plays the Clairton Bears at Neil C. Brown Stadium in Clairton on Friday, Oct. 3, 2014. Both teams boasted full stadium seats on either side of the field, with loyal fans and players past making the trip, even with calls for rain on the weather report. "I love to watch 'em play. 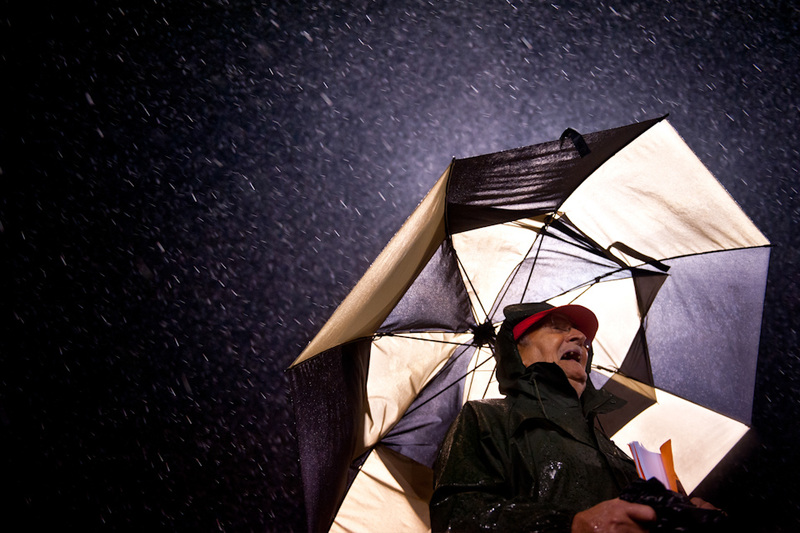 I come up here every practice," said John Mallozzi, 83, of Clairton, as he watches the Clairton Bears high school football team play in the rain at Neil C. Brown Stadium in Clairton on Friday, Oct. 3, 2014. Mallozzi says he has been watching the Bears play all of his life. 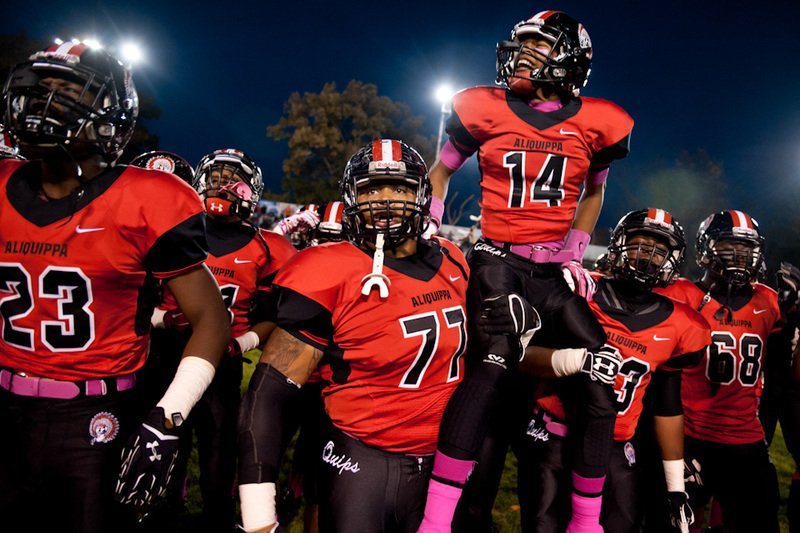 Aliquippa Quips high school football players hoist QB Darrien Fields into the air as he shouts towards a packed stadium at the start of the high school's homecoming game in the Carl Aschman Stadium in Aliquippa on Friday, Oct. 24, 2014. A handful of NFL greats such as Mike Ditka and Ty Law have called the former steel town home in the past.